As a quick update to my blog about V630 Cas, the anticipated outburst is still under way. 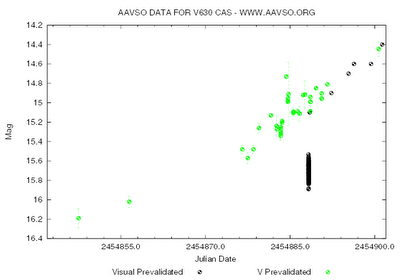 This is pretty unusual for the types of dwarf novae I normally follow. Three weeks ago we suspected it was going to go into outburst, and here it is still slowly rising. Most of the time, a dwarf novae would have risen to maximum in a day or two, remained there for a few days and then began to trail off in brightness until it reached minimum after a week or so. Obviously, V630 Cas is a horse of a different color.